Since their arrival at Compass Aviation, Jamin has accrued over 100 flight hours and has been able to complete his commercial flight training. He is also daily adding to his experience as an aircraft mechanic as he works alongside our permanent staff in the maintenance shop. The Pecks passed their technical evaluation with New Tribes Mission, and will be moving on to NTM's missionary training center in January 2012. Their vision is to serve in Indonesia with New Tribes Mission Aviation. 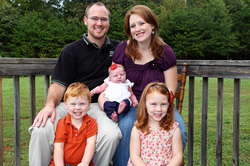 Jamin & Elizabeth have three children, Esther (4) Jaren (2) and Eliana (newborn).